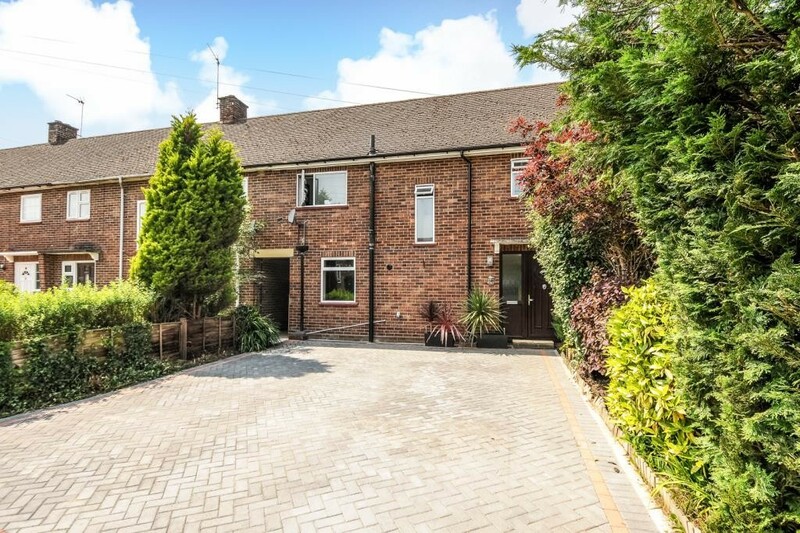 This Ascot terraced home is for rent and offers three bedrooms, and multiple baths and reception rooms. 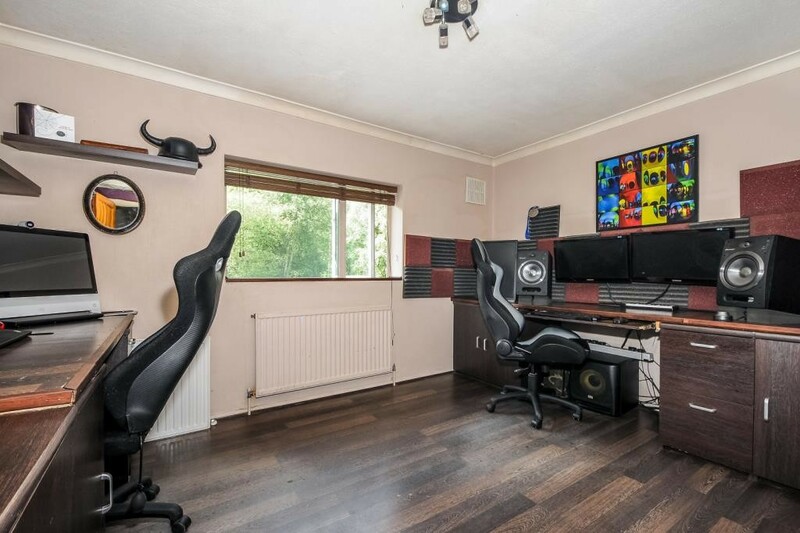 Quite the unique property, this three bedroom home is unlike any other on the market in Ascot. The red brick building has an ample driveway made of stone pavers. There is room enough for four cars to park in the driveway, off the street, making it perfect for a share. 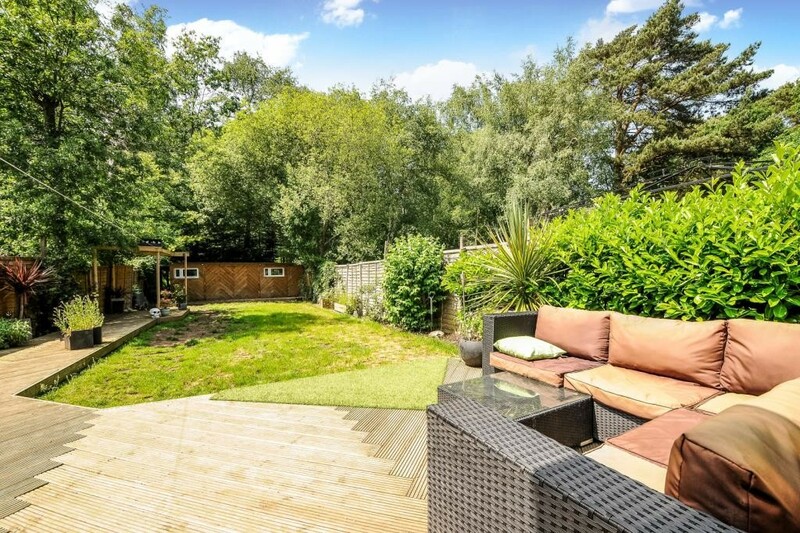 The outside of this Ascot home rentals already landscaped with mature trees and shrubs. When entering the Ascot home for rent, you see the first of two reception rooms. The first has plenty of built in cabinetry for all your storage needs. Next to the storage shelving area, that offers a long six-foot countertop; there is a picture window. This floor is a dark wood like surface that is easy to clean. 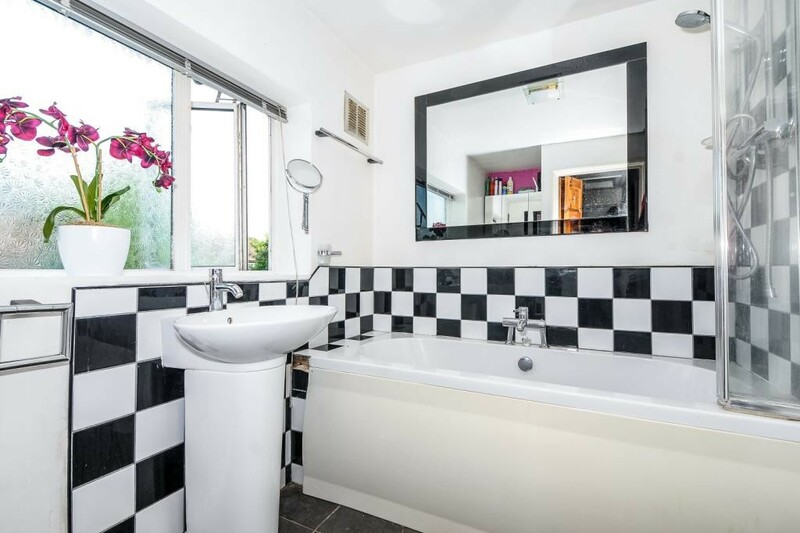 This ground floor also has a full bathroom decorated in black and white. With an oversized tub for bathing and an enclosure of glass for taking a shower; including a hand wand this bathroom is fully equipped. With a pedestal sink and bright windows, some with texture to obscure the view but all allow the light to come in. The windows offset by a large matching mirror over the tub. 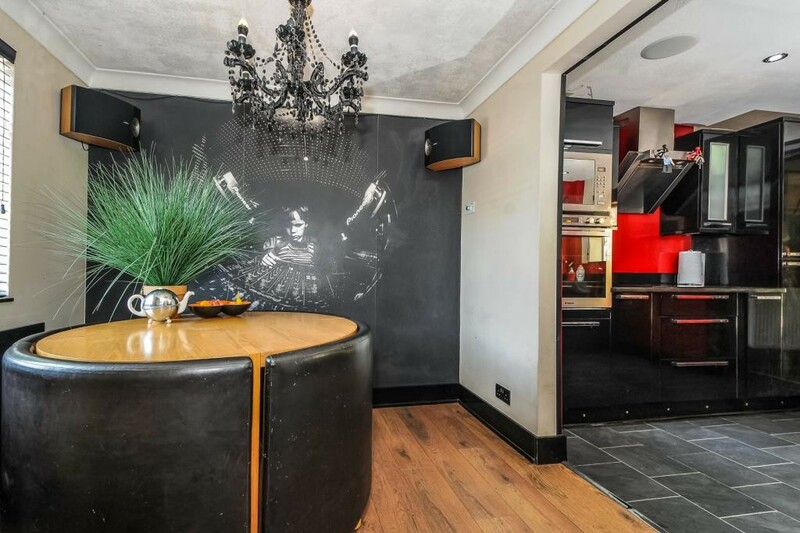 This Ascot home for rent is full of highly decorative touches. The second floor hosts the master bedroom that is a full 23 feet long!. This area has a wall treatment, arched or peaked ceiling, and a decorative accent wall on one end. The window to this room is huge and allows for tons of natural light. This bedroom, like most all of the house, is hardwood flooring for a luxurious look. The ground floor of this Ascot home rental has two double bedrooms. One is pictured here with two complete desk set ups. 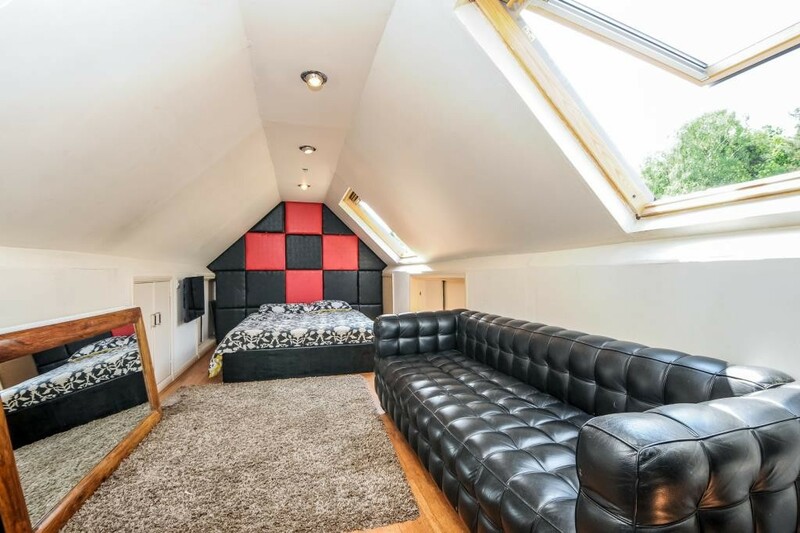 It’s easy to see the amount of room in the bedrooms in this photo, and you can count on the second ground floor bedroom to be of the same size. The second reception room in this Ascot home rental is shown here with a large 200-gallon fish tank. The tank takes up considerable room in this photo, but the tank will not be on site after this tenant. 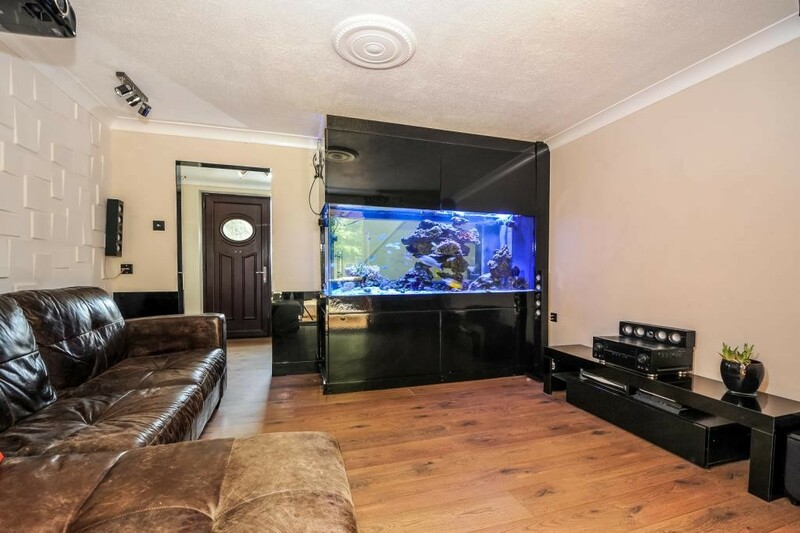 Without the fish tank, you will have nearly 25 feet of reception room space. Next to the kitchen is the formal dining room of this Ascot home rental. It has a large accent wall shown here in Granite color. It also has mounted speakers and a chandelier that matches the moldings. The floor is wood and buts up to the tile of the kitchen. This Ascot home rentals kitchen is ultra modern with stainless steel appliances. The floor has slate gray oversized tiles and black cabinetry. There are ample countertops on both sides of the kitchen made of black granite. 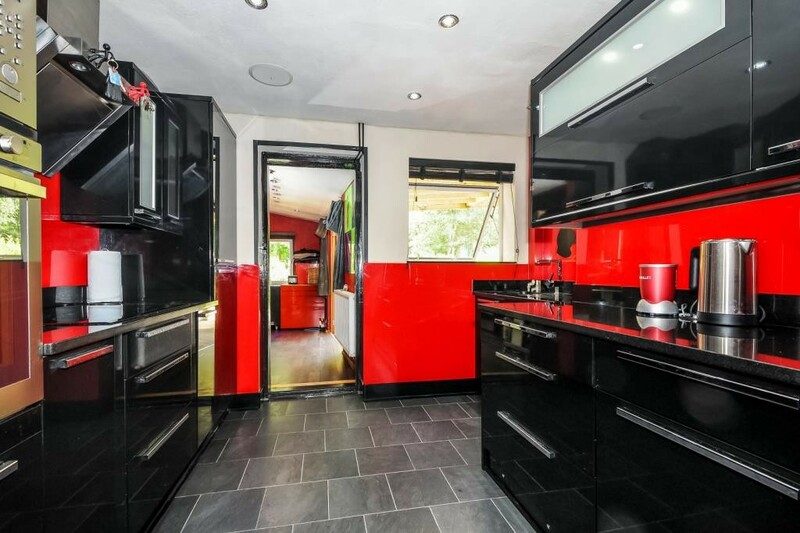 The kitchen has all the modern appliances any cook could want. 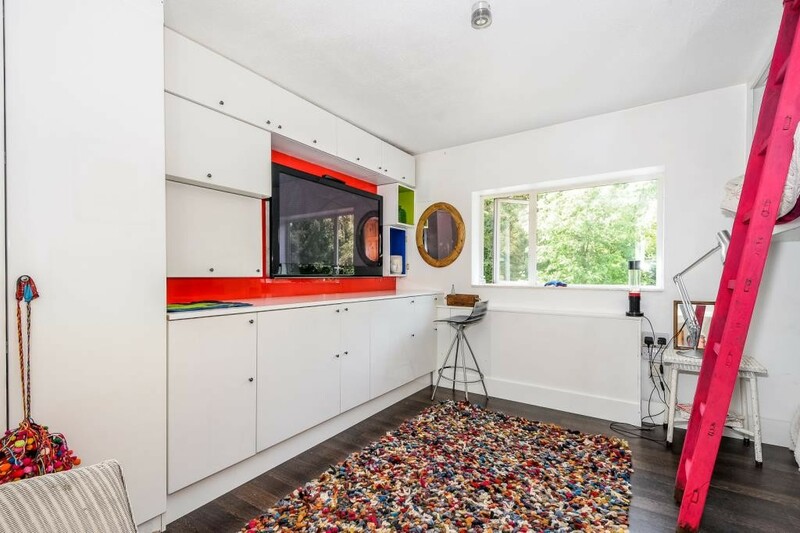 The kitchen has a large picture window at one end to let in all the natural daylight, and it connects via a doorway to the back reception room of the Ascot rentals home. But for all the beauty of this Ascot home rental inside the dwelling, it’s the outdoor living space that makes this house special. 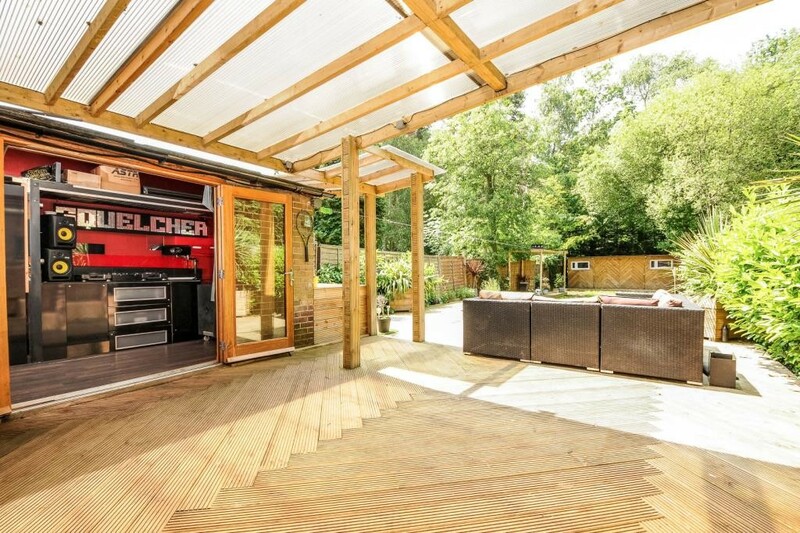 With a large covered deck area that leads to an oversized and decorative decking, you’ll be drawn to the home instantly. There is a second area that is uncovered containing a large couch, L-shaped sofa set, and sliding glass doors from which to enter the backyard oasis. The backyard doesn’t end with this Ascot home rentals decking. The patterned decking extends beyond the couched seating area, down along the property and under a gable to the back of the property. Here there is plenty of grassy space to please any children, or if the need for a pet has requirements to fill. Either way, this Ascot home rentals’ outdoor space is actually living space; when combined with all the room inside you’ll have a hard time finding more in Ascot than this home offers.